Cuiavian University in Włocławek invites enrolees, students and lecturers form Ukraine to cooperate and gain a degree. Cuiavian University in Włocławek is the oldest and one of the largest non-public higher education institutions in the Cuiavian-Pomeranian Voivodeship. In 2020, it will celebrate the 25th anniversary of its scientific and didactic activity. The university has a population of 20,000 graduates. 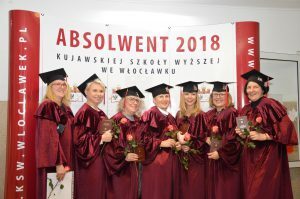 Cuiavian University in Włocławek holds first-cycle (bachelor’s and engineer’s), second-cycle (master’s) studies and a uniform 5-year Master’s degree. The offer of education includes the following fields of study: administration, occupational safety and health, national security, construction, economics, energy, physiotherapy, mechanical engineering, logistics, pedagogy, nursing, transport. Studies on national security, physiotherapy, nursing and pedagogy give you the opportunity to obtain a Master’s degree. • A friendly and friendly atmosphere conducive to learning and developing professional competences.